I guess amcars can travel far from home, since they're popular around the world. I just got myself my X-mas gift: a '00 MGM LS in Silver Frost (I believe that's the correct color option name), with Magnaflow tail mufflers for a slightly louder rumble and the suspension converted to CVPI shocks and springs (so the ride's pleasant, but the handling is firmer while cornering). Glad to be a member of the family! Welcome to GMN. I have family roots in Krakow, Warsaw, and a little village in the middle of nowhere. Sadly, none of the language or culture was passed down, but always glad to see a Pole around. Welcome to the forum. How did you come about getting a car like this? You should try some * eeek * European cars. Anyhoo, always had a thing for the rides from across the big pond. When the Iron Curtain fell on its stupid ugly face, my dad imported a Pontiac Trans-Sport in 1990. Then he got a Nissan Praire, a Jap, but from the US market, too. The first ride I got with the money I made was a '97 Windstar (which got hit by a... VW Polo). I claimed the damages from the perp's CL insurance and bought a '96 Grand Voyager LE (3.3 gasoline, built in Austria for the European market; it still goes strong, despide my pops' efforts at dinging it every now and then, LOL). That was also the first used car I learned to fix and what to avoid when buying used cars (spent 60% of the purchase price on parts and repairs for that sucker, but it was well worth it!). In 2011, I bought an '05 300C 5.7 HEMI. And the amcar love grew on me stronger. Boy, what a ride. The sound, the feel, that sense of driving a big, uncompromising V8 from the States! After a time I got down with the Saab scene, followed by a horrible '06 Audi A6 3.2 FSI Quattro. While it was very agreeable in terms of handling, fuel economy, comfort and speed, it was... mediocre in design and service life of parts (I would NEVER buy a new one had I known the quirks and fritzes it had between 80k mi and 100k mi. GROSS!). That's German tech for you, if you want a good one, get a W123 Benz. Finally I got in with the Polish amcar scene. And I mean, they got it all. Nashes, Packards, B-Bodies, Foxbodies, anything from the 1940s to modern cars. While I like tons of steel and chrome snugly wrapping a big block V8, I was torn between the classic full-size sedans and the modern automobile conveniences. Having given the next purchase some good, hard thinking, I settled for the Panther. CVPI seemed enticing, but it lacked that something. I find the Town Car's luxury very much appealing, but I'd have to crank up its handling and acceleration too much for my current "I'm-Signing-A-Home-Mortgage" budget (though it's doable, I know a Polish guy who lives on the Eastern seaboard with a TC that packs an engine from F-350, custom suspension and a rear axle and diff lock from a Mustang. I even considered the last Eldorado and the last Riviera, but... the budget, the FWD and the potential woes of the infamous Northstar made me look elsewhere. Hence, I grabbed an LS right before X-mas. Some obvious age-related electricity quirks in the interior and a small blister of rust aside, it's as strong as Popeye on a can of spinach. And I love it! Last edited by SpitShine_PL; 12-27-2018 at 01:35 PM. I can understand the attraction to cars that aren't available over there. I lived in Germany for four years and took a liking to some of the cars over there. My favorite car I owned over there was a 2002 Ford Mondeo wagon with the 2.0 TDCI diesel engine. Great little car with plenty of space and very respectable power. Good fuel economy, too. I envy Europeans getting all the nice estate cars while they're all but dead over here. Great story. Enjoy the car! Welcome! Will you be taking care of maintenance or will you have a shop do it? I practically live like it's 1993. @Giraffe, Mondeo is neat, true that, especially the wagon. Although it deserves something better than a four-banger, and the overpriced performance Sport version. A nice gasoline-powered 5-banger would be great. @79lincolnlover, Panthers are relatively simple cars, so I am doing the basic stuff (tune-ups, consumables, wearable parts) on my own. 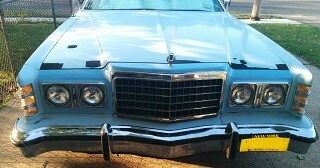 I also manned up and will be doing the headlight wiring and relay improvement over the weekend. My dad in law has an official Motor Vehicle Inspection station (it's something like the British MOT) + a regular service garage, so I have access to a column lift and a pit... it's 35 miles away from me, though. On the bright side, I got a European Norauto service chain point like 300 yards from the front door, and they are quite proficient, did the whole front end on my parts - which are aplenty in stock in Poland, so that's another positive. And, they are quite cheap (did the WHOLE front end for less than 300 USD). Glad to see more overseas Panther lovers. Welcome to the family and we'll help you any way we can.